Yogi Aaron’s greatest desire is for people to realize the fragility of life and savor every precious moment. He believes too many of us live in the shadows afraid to embrace the abundance that will deliver us to our destiny. His mission is to hold space for those curious enough to become still and discover their own unique brilliance within. Yogi Aaron is a liberator, a change initiator. 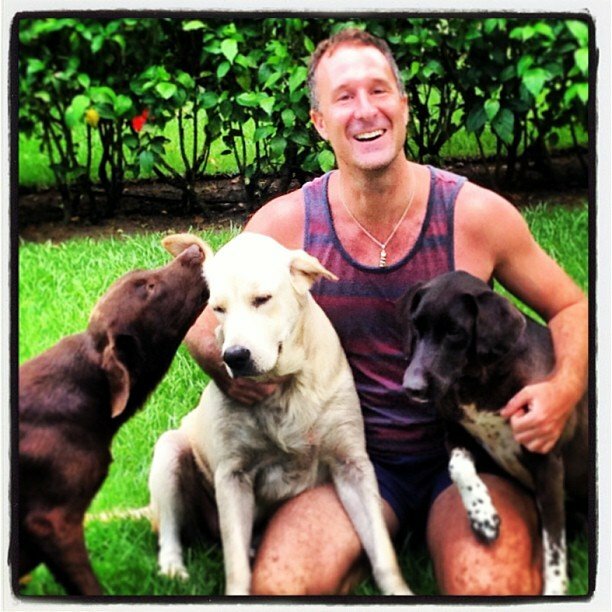 He is a Master Teacher of Yoga, an International Retreat Leader, the author of ‘Autobiography of a Naked Yogi’, the founder of Blue Osa Yoga Retreat in Costa Rica, a born adventurer, and an avid animal lover. His message is one of conquering fear and saying yes! to life with courage, faith, and grace. His intention is to inspire all of us to realize our inner strength and cultivate indomitable will, so we’re able to reveal our best self and shine brightly. His is a story of becoming unbound. Like many contemporary teachers Aaron wasn’t born into yoga, it chose him. A product of the 70’s Aaron grew up in British Columbia, Canada. A confrontational childhood and brutal boarding school education set him on an altogether different trajectory. Instilled with steely determination and love for the great outdoors he strove to understand himself in untamed landscapes. The wilds of northern Canada, the underwater wonderland of the Caribbean and the Holy Himalayas all provided a rich playground for his unraveling. Lost in nature, he found his true nature. It was Aaron’s natural inquisitiveness, the influence of his new-age mother and an interest in maintaining good health that delivered him to yoga at just 18. It sparked a flame that he could not quell. Yogi Aaron felt called to yoga. It kept him awake at night until he made a lifetime commitment to becoming a devoted student of yoga. He started to travel the world in search of the most highly regarded spiritual masters of his time (something he still does today). He made pilgrimages to ashrams and retreat centers in order to understand the Vedic tradition and Tantric path. Driven by his desire to help others he went to great lengths to explore the wisdom passed to him. There is no denying his own life experience has molded him into the charismatic man and compassionate teacher he is today. Yogi Aaron’s students observe how he has a special way of stripping yoga down to it’s bare roots and packaging its pearls of wisdom in a way that makes it easy to connect with, practice and apply to life in this modern day. His personal journey to free his own identity provided fertile ground for healing and growth. It honed a philosophy and attitude to life that was to become the cornerstone of his teachings itself. He began instructing students in yoga asana, pranayama, and philosophy in 1997. By 2001 Yogi Aaron notoriously exploded onto the New York yoga scene and became an overnight sensation. By creating a haven for people to come, practice and be themselves he became a prominent figure in the yoga community. That recognition leads him to start leading workshops and retreats internationally. In Yogi Aaron’s signature style of always striving to contribute more, he felt passionately compelled to open a retreat and cultivate a yoga community in Costa Rica. Fueled by a dream to share the leanings of his life’s work ‘Blue Osa Yoga Retreat and Spa’ was born. Blue Osa is a picture perfect, ocean-kissed sanctuary tucked away on the Osa Peninsula. It provides people with space to recharge and reconnect, free from everyday distraction and stress. Blue Osa welcomes 800 yogis per year and is the setting for Yogi Aaron’s own fully accredited One-Month Immersion Teacher Training. Thanks to his investment in professional development he offers comprehensive training for new and advanced teachers with 200hr and 500hr residential programs. When Yogi Aaron isn’t teaching or studying he can be found making homemade jam for his students or surfing with his dogs in Costa Rica. Watch Yogi Aaron on Youtube now. I read this every once in awhile to as part of my intention and perseverance toward planning my first Costa Rican retreat. We’ve been in contact, and I’m making progress. I know I’ll get there as I continue to make steps in that direction. Thank you, Yogi Aaron, for your inspiration!